We took our niece, Gabriella (Nicholas's cousin) for a day of fun activities as part of a birthday gift to her. We had lunch at the Crayola Cafe, went to see a play at the Coterie Theater, Frindle, and had ice cream at Sheridan's afterwards. At the Crayola Cafe, they offer a nice selection of Crayola crayons, of course, and the placemats have a simple drawing that you can color in. Here's some of the artwork that we produced (I did not get a chance to reproduce Gabriella's composition, that involved, among other things, a multi-colored rainfall). Here are the other three pieces of art. We're getting the exterior of the house painted, so the star on the ladder is the painter we have hired. He usually brings one of his dogs with him when he paints, which explains the Dalmatian flying by on the frisbee. The birthday cake is for Gabriella. There is a dispute over the unfortunate person in the corner who had a paint brush dropped on him. 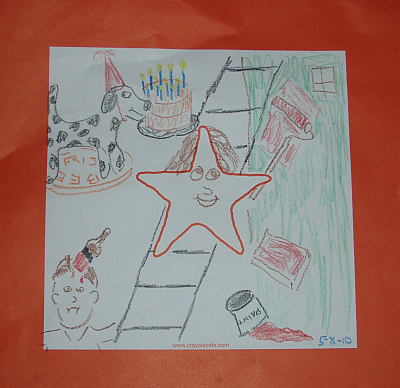 The original artist claims that it represents Nicholas, but Nicholas says it looks more like Dad. If you have to spend more than a single sentence explaining it, then it really isn't art. But I had fun drawing it anyway. 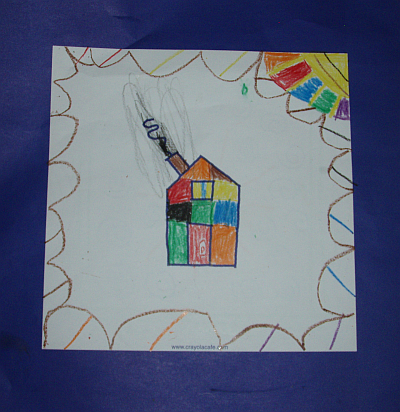 The multi-colored house is a Nicholas creation, including a chimney that is contributing markedly towards pollution of the atmosphere. 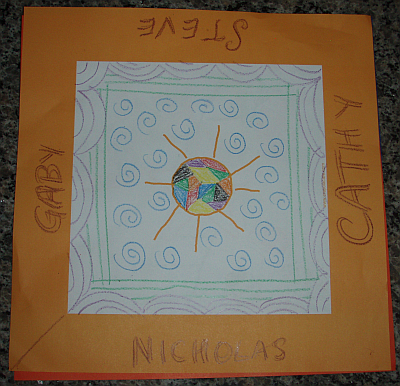 The tiled sun is solely Cathy's creation, though she gives credit to the others around the table who inspired her.